As a ColdFusion developer, my own journey to finding the perfect development environment has been, I suspect, fairly typical. I cut my teeth with Dreamweaver. I progressed to ColdFusion Builder 1, then 2. I toyed with Notepad++. I gave Eclipse a whirl. Most recently, I’ve been developing almost exclusively in Sublime Text 2. I feel that my switch to Sublime Text has increased my productivity, so naturally I was curious about what others in the team were using, and whether it would be worthwhile purchasing licenses for the team(s). To find out more, I asked colleagues within Development Services to participate in a survey about their development environment preferences. Q1. What languages do you work with? Question 1: What languages do you work with? With skills across a range of software platforms, we’re not a one-tech-shop, so to get some context I had to ask respondents about what languages they were developing in. 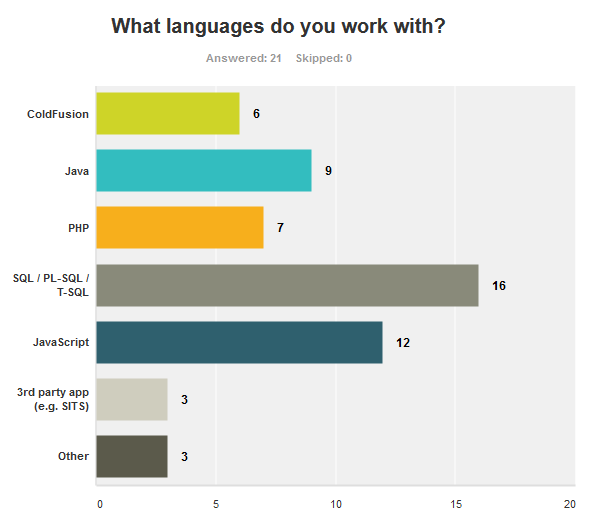 It was interesting to note that we have more developers using Java than ColdFusion, despite ColdFusion being our primary development platform.In hindsight, perhaps I should have framed the question to include a weighting on time spent on each language. The 3 “Other” responses were: Bash, Unix shell scripting and C#. Q2. How do you run your local development? Question 2: How do you run your local development? I thought that whilst I had people completing the survey, I might as well try to find out some additional things about how they worked, like their approach to local development. 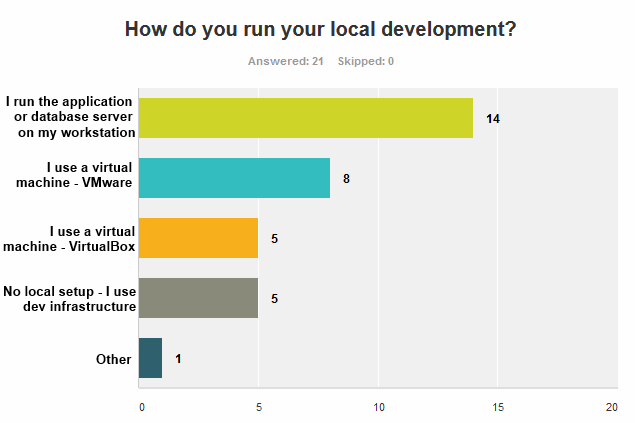 I was surprised by the number of respondents who use locally installed server software, personally I have found the use of virtual machines to have huge advantages in simulating infrastructure, and assisting collaboration within projects. From the two main virtualisation options, VMWare player has the edge over VirtualBox. Q3. What do you currently use as your primary development tool? 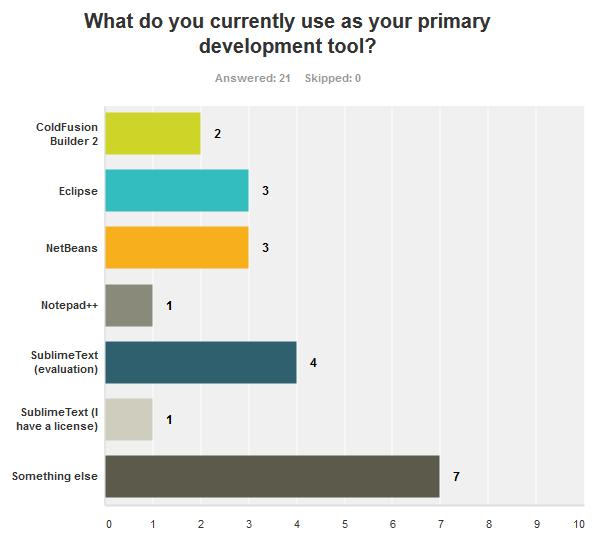 Question 3: What do you currently use as your primary development tool? This is the question I was really interested in: What IDEs or editors are being used for development? It looks like Sublime Text has the edge, with Eclipse and NetBeans coming in close second. Q4. How do you feel about the IDE/editor you chose? 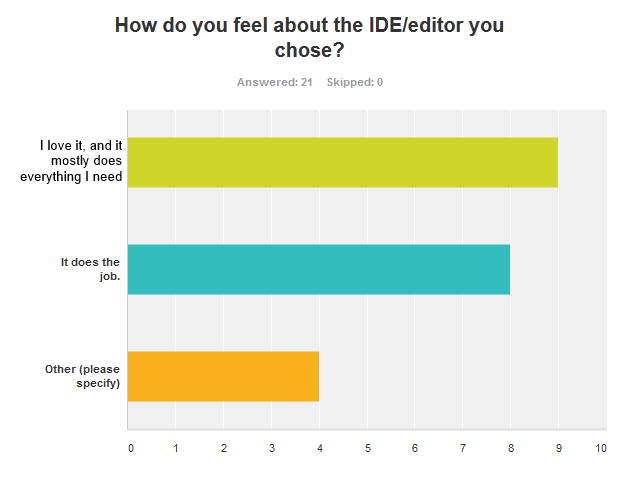 Question 4: How do you feel about the IDE/editor you chose? I asked this question because I wanted to know if people are satisfied with what they’re using. Q5. What features do you use? Question 5: If you use an IDE, what features do you use? I wanted to know more about what features our developers were looking for in their choice of IDE/editor. 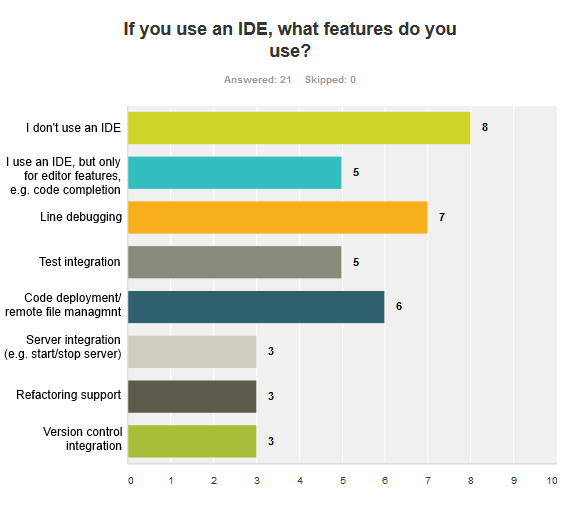 The results show that only around half of the respondents use the features that IDEs provide, the other half are only using it as an editor, or not using an IDE at all. 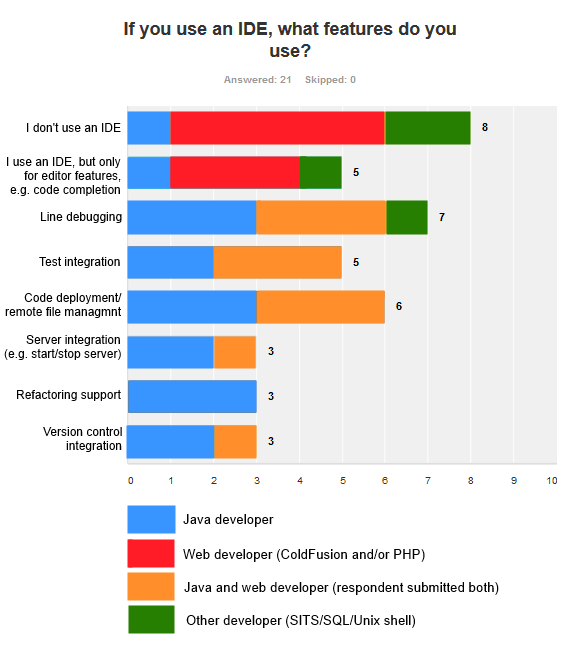 Correlation between development platform and usage of IDE features. All but two of the Java developers use multiple IDE features. No ColdFusion or PHP web application developers use IDE features unless they also develop in Java. The developers working on 3rd party applications do not use IDE features except for one respondent who uses line debugging..
My own experience of using these IDE features within a ColdFusion / ColdFusion Builder context has been largely frustrating. Line debugging in particular would be a useful troubleshooting technique, but configuring it to work with my local development environment (i.e. ColdFusion running in VMs) is enormously difficult and can turn into a huge timesink. This is an area where collaboration may be useful to find some kind of solution that is workable. Q6. Would you like a Sublime Text license? Question 6: Would you consider switching to Sublime Text if a license was purchased? Sublime Text is not a free product. Would more developers use it if the University provided licenses? The results suggest that three quarters of those surveyed would be interested in getting a license for this product. People are using a wide variety of tools to support development. Most ColdFusion developers only require editor features, whereas most Java developers use multiple IDE features. Many developers would like to use Sublime Text if we had a license for it. 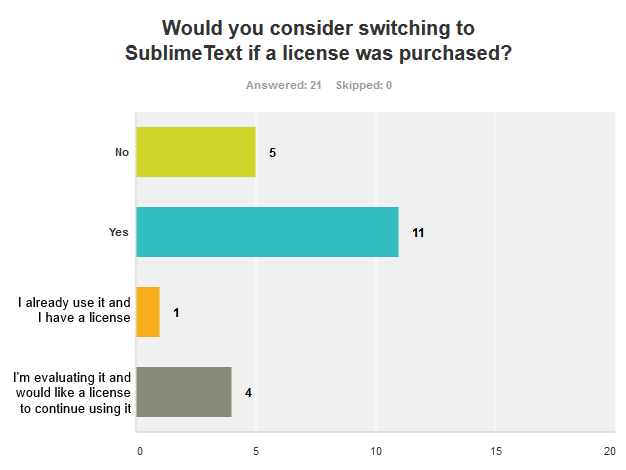 Thanks to all who participated in the survey, I feel that the results demonstrate that there is a strong case for offering Sublime Text licenses for those who would find it useful.